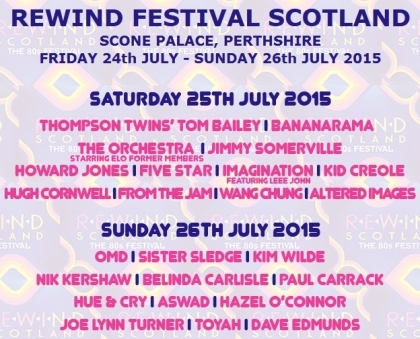 "Rewind Scotland – The 80s Festival" in Perth, Scotland is back for its fifth consecutive year. The festival will take place from Friday 24th July until Sunday 26th July 2015 at Scone Palace, Perth, Scotland. As with the previous four Rewind Festivals at Scone Palace, this year’s Rewind extravaganza will provide an even bigger bang with the crème de la crème of classic 80’s pop music. The festival includes an all-star 80s line-up featuring Bananarama, The Orchestra starring ELO former members, Jimmy Somerville, Kim Wilde, Nik Kershaw, Sister Sledge, Belinda Carlisle, Five Star, Howard Jones, Altered Images, Hue & Cry, Kid Creole, plus many more big names, including for the very first time, ex-Rainbow lead singer Joe Lynn Turner, plus From The Jam featuring the legendary bassist Bruce Foxton. This year’s headline performances include Thompson Twins’ Tom Bailey and electronic pop sensation OMD who are known worldwide for their hit single 'Enola Gay'. As with all past Rewind Festivals, the 80s celebrations will showcase non-stop music on the main stage from the biggest 80s icons, plus plenty of audience participation and plenty of nostalgic dressing up. Tickets go on sale at 9am on Friday 23rd January 2015.Full details about ticket outlets and prices are available from the official Rewind website: www.rewindfestival.com. Rewind Scotland will once again take place at the historic setting of Scone Palace in Perth; home of The Earls of Mansfield and the crowning palace of the Kings of Scotland. The festival will also feature plenty of additional non-stop festival fun from the Silent Disco to Live Karaoke Bar, as well as Camping and Glamping (aka Glamorous Camping) options. For the ultimate festival experience at Rewind Scotland, When Nature Calls wristbands will be available; giving festival goers access to posh loos, cleaned after every use with warm water hand washing facilities and mirrors, housed under a luxury stretch marquee with café and chill out zone.